Tersane Bahçesi and Aynalıkavak Kasrı with the imperial caique with kiosk. Gaznevî Album, İÜK T5461, 25v. This catalogue offers essential source information on 114 Ottoman gardens from the fifteenth to the nineteenth century. Although most of the gardens included here are located in the three Ottoman capitals (Bursa, Edirne, and Istanbul), information can also be found on Ottoman gardens in Erzurum, Amasya, and Plovdiv. Most of the catalogued gardens were either physically connected to palace complexes, such as Topkapı, Beşiktaş, and Edirne, or were courtly commissions for sites elsewhere, such as Fener, Kağıthane, and Kalender. Others, such as Alibeyköy, Bayram Paşa Bağı, and Abdal Murat Sultan, were were used as outdoor spaces of public promenades. Some of the entries employ sources that focus on the architecture of the sites, and others provide specific information on plants and trees that were cultivated in them. Each entry includes a selected bibliography of eyewitness accounts from the periods in which the gardens were in use under Ottoman rule as well as seminal contemporary academic works that study and discuss these gardens in detail. 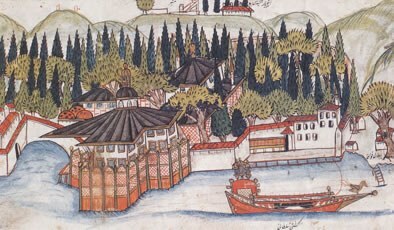 For descriptions of most of the Ottoman gardens that existed before the eighteenth century, the book of travels of Evliya Çelebi (1611–1682) has been an indispensable source for the original contributors of this catalogue, as have been the Istanbul-centered urban descriptions of Eremya Çelebi (1637–1695). The contributors’ individual commentaries for the gardens also take into account the lifespans of these sites, which often survived for centuries, by tracing narrative and visual sources diachronically to reveal how their ownership, form, and function changed over time.